It was the rain that did it: the rain signaled the beginning of the end. “It wasn’t just rain,” says Johnny Depp, “it was enormous rocks of hail which hit me on the head and filled the pockets of my coat full of ice. I’ve been in torrential downpours before, but this was insane—I’ve never seen anything like it, it was epic, it was like . . . Noah’s Ark or something.” There were in Las Bardenas, in the desert in northern Spain, on the set of Terry Gilliam’s highly anticipated film, The Man Who Killed Don Quixote, and the crew could do nothing but try to stop their equipment floating away on the rapids of the flood. The next day, the set was awash with mud, and when it had dried out, the landscape had changed; the earth was a different color and there were patches of green sprouting through, and from a continuity point of view, all the previous shooting was useless. “It was almost as if there was this strange dark cloud hanging over us,” says Depp. They had had pre-production problems, but all within the normal range (unsigned contracts, puppets that had to be remolded, problems with the horses, lack of rehearsal time), though everything was exacerbated by a critical lack of budget. But this was all something Gilliam could absorb, something he could live with. Then it began to get more serious; Jean Rochefort, the veteran French actor who was playing Don Quixote (and he was perfect for the part, says Depp, just perfect) developed a prostate infection days before shooting commenced, and cancelled his flight. Finally, in September 2000, all the actors were assembled. Yet even on the first day of filming it became apparent that nothing—nothing—was going to go smoothly. There they all were—Quixote, the horses, the extras, the cast, a brace of producers, a huge crew and even a couple of documentary makers filming the filming—when they were joined by a group of F16 fighter jets, dropping bombs and making the most unbelievable noise. The set, it transpired, was also a military testing ground for NATO. The final blow came on the fifth day of filming, when it became apparent that Rochefort, an accomplished horseman, was in serious trouble. He was in so much pain he could barely ride, let alone act at the same time. After one scene, when it took two men to get him off his horse and half an hour for him to walk the short distance to his car, things began to look very, very bad. At that point, says Depp, they realized they were doomed. Rochefort flew back to his doctors in Paris and everyone waited. The days passed. The investors visited the set, followed by the insurers. No one knew what was going on. After ten days, the news came: Rochefort was suffering from a double herniated disc, and even if he were able to come back he would not be riding a horse for a long time. After a couple of days, the cast heard that Gilliam had gone back to London. “I think I was one of the last to leave,” says Depp sadly. For years, Terry Gilliam had been trying to make a film about Don Quixote, the Spanish legend whose poetic fantasies led him wildly astray. There was already a history of bad luck attached to filming Quixote; Orson Welles tried to make his own film, shooting between other projects, over a period of 20 years; in the end his Quixote, Francisco Reiguere, died and it had to be abandoned. Gilliam’s problem was money—he’d made several unsuccessful attempts to finance it in Hollywood (Don who? ), but European finance was hard to acquire (he needed 40 million pounds—vast by European standards), even with Depp and Vanessa Paradis on board. He had a wonderful script, written with Tony Grisoni (“I was just stupefied when I read it,” says Depp. “It was like reading a really well written novel. I instantly just dove in”), a committed cast and a budget of sorts: 32.1 million pounds. Gilliam asked documentary filmmakers Louis Pepe and Keith Fulton to join him to film the making of the film. They had made a documentary called The Hamster Factory about Gilliam’s film 12 Monkeys, and he wanted them around “for insurance purposes.” Although Don Quixote was never made, the documentary—which covered two weeks of pre-production as well as the six days of shooting—was. Narrated by Jeff Bridges, Lost in La Mancha shows a buoyant, exuberant, giggling Gilliam, initially bullish in the face of looming chaos (“if it’s easy, I don’t do it. If it’s virtually impossible I have a go at it . . . Without a battle, I don’t know how to approach it,” he says), getting more and more downcast. When Depp saw it for the first time, the thing that really upset him was seeing Gilliam shrink before his eyes. Depp knows Gilliam well (they made Fear and Loathing in Las Vegas together), and he believes he is one of the great filmmakers of all time. “Terry was so excited, you know how he is—big and broad and just exploding with excitement and giggling constantly,” recalls Depp. “He’s an insanely passionate, curious and knowledgeable man. And he was loving it, just loving it—then, day by day, you’d see him shrink. It was hard to see Terry like that; he looked beaten—and Terry’s a hard guy to beat. And it’s really sad because it would have been, like, The Best of Terry Gilliam. You can, of course, imagine him as a pirate. But he doesn’t play to his looks—on the contrary, he gets his roles despite them. Playing Hunter S. Thompson, he wore painful wedges to make his ears stick out, and draped seventeen sad little hairs across the top of his shaved head. This is not the action of a man concerned with glamour and grooming. Most of his films are interesting and unpredictable—some are brilliant: Ed Wood, Don Juan DeMarco, Dead Man, Edward Scissorhands, Arizona Dream, Donnie Brasco, Sleepy Hollow. He does odd things for the right reason—John Badham’s Nick of Time, for example, was a thriller based in real time, which appealed to Depp. It was largely overlooked, but the basic idea has become very successful in the TV series 24. Depp does things because he’s interested in the character—be it an opium-addicted cop in From Hell or a Buster Keaton wannabe in Benny & Joon. He has worked with some amazing actors (Marlon Brando, Faye Dunaway, Vincent Price, Martin Landau, Al Pacino, Judi Dench, Robbie Coltrane, Juliette Binoche) and with the best directors (Gilliam, Tim Burton, Emir Kusturica, Roman Polanski, Jim Jarmusch). And they all love him—actors, directors, grips, drivers. Why? Well, he’s gorgeous, for a start. No matter what he does to himself—stupid woolly hats, unseemly baggy trousers, weird hair. He’s intelligent and funny. And he’s a good actor—an extraordinary actor. There is an unfinished quality to his acting which leaves endless room for possibility. His face is so expressive: emotions dance across it in a minute ballet of innuendo. He does a very good mixture of wonder and weirdness, and the combination of his talent and his looks means he can get away with stuff that others can’t. Imagine Matt Damon playing Edward Scissorhands (Depp based his performance on a dog) or Brad Pitt playing Ed Wood (Depp based his performance on Ronald Reagan). And somehow—and directors must realize this—Johnny Depp conveys an idea of art and substance. Of cool. 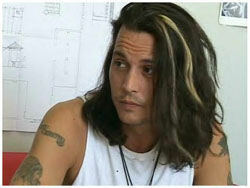 If Johnny Depp’s in your film, then it must be interesting. It may not be a box office hit but it won’t be pap. He loves France; he can smoke in peace, and is extremely fond of the grape. He’s not very happy about French politics, but then he’s not a person that feels involved in that sort of thing anyway. In fact, “It’s all horseshit. But this is interesting: not long ago, I met Tony Blair. I spoke with him for a bit and was able to watch him behave, and the guy was really a gentleman. I got the impression that he absolutely cares and it was sincere. I’ve met a lot of politicians over the years and found them to be plastic, but this guy wasn’t—he seemed like a good guy. I was shocked.” What did they talk about? 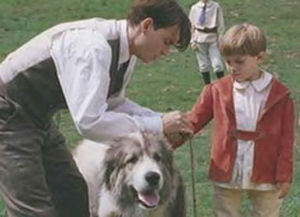 Children, says Depp. Films and children. “He talks about his children all the time,” says Gilliam. “It’s boring beyond belief! If he shows me one more picture of his kid, I’ll kill him.” He laughs maniacally, then collects himself. “He’s happy—isn’t that awful? He’s content! No, it’s nice to see him happy, there’s no question about it—but I don’t want him happy too long.” Gilliam is in the process of trying to buy back the script from the insurers and start all over again: Depp is on board, but they might have trouble getting Rochefort insured. The good thing from Gilliam’s point of view, is that Lost in La Mancha leaves your mouth watering to see the real thing. It’s the best trailer a film has ever had. And even if The Man Who Killed Don Quixote never happens, better a good film unmade than a bad one made.